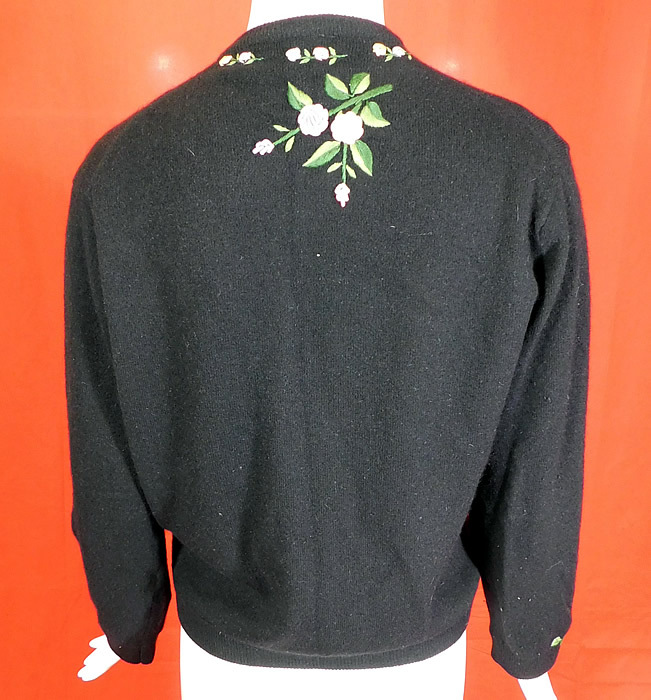 This vintage Hong Kong black lambswool angora rabbit rosette embroidered sweater dates from the 1950s.It is made of a black lambswool, angora rabbit hair knit fabric with pastel raised French knot twisted woven wheel stitch hand embroidery work rosette flowers and padded satin stitch embroidered green ombre leaves. 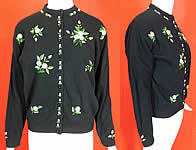 This fabulous floral cardigan sweater has a ribbed fitted waistband, cuffs, collar, long full sleeves, fully lined in a black nylon fabric inside and black buttons down the front for closure. The sweater measures 22 inches long, with a 42 inch bust, 34 inch waist, 16 inch back and 22 inch long sleeves. There is a "Made in Hong Kong" label sewn inside. It is in excellent condition. This is truly a wonderful piece of wearable art! 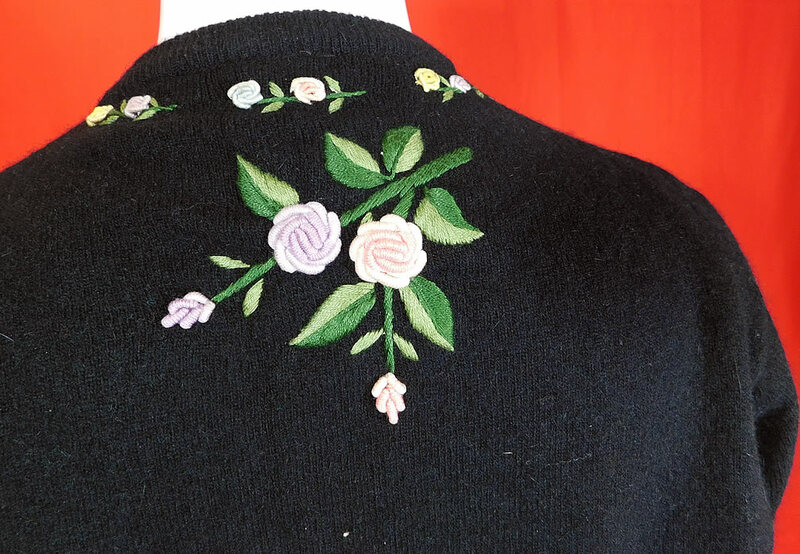 This vintage Hong Kong black lambswool angora rabbit rosette embroidered sweater dates from the 1950s. 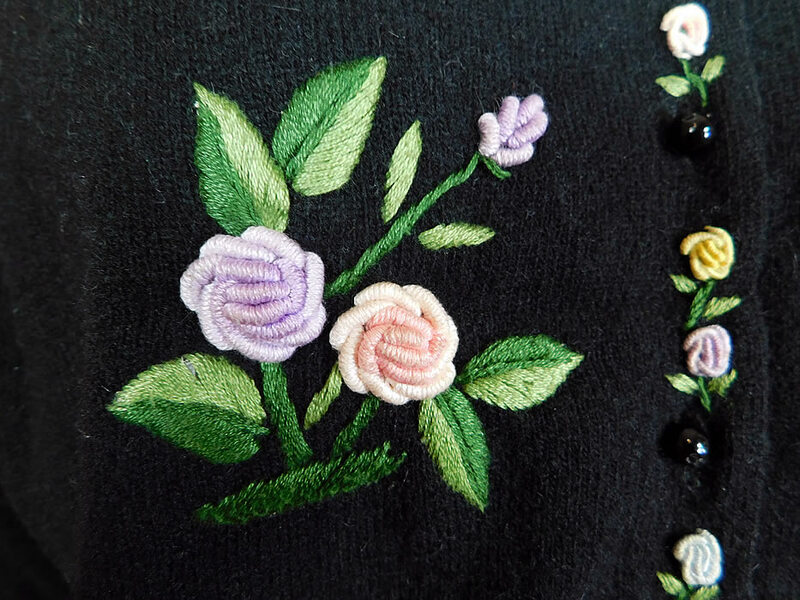 It is made of a black lambswool, angora rabbit hair knit fabric with pastel raised French knot twisted woven wheel stitch hand embroidery work rosette flowers and padded satin stitch embroidered green ombre leaves. This fabulous floral cardigan sweater has a ribbed fitted waistband, cuffs, collar, long full sleeves, fully lined in a black nylon fabric inside and black buttons down the front for closure. The sweater measures 22 inches long, with a 42 inch bust, 34 inch waist, 16 inch back and 22 inch long sleeves. 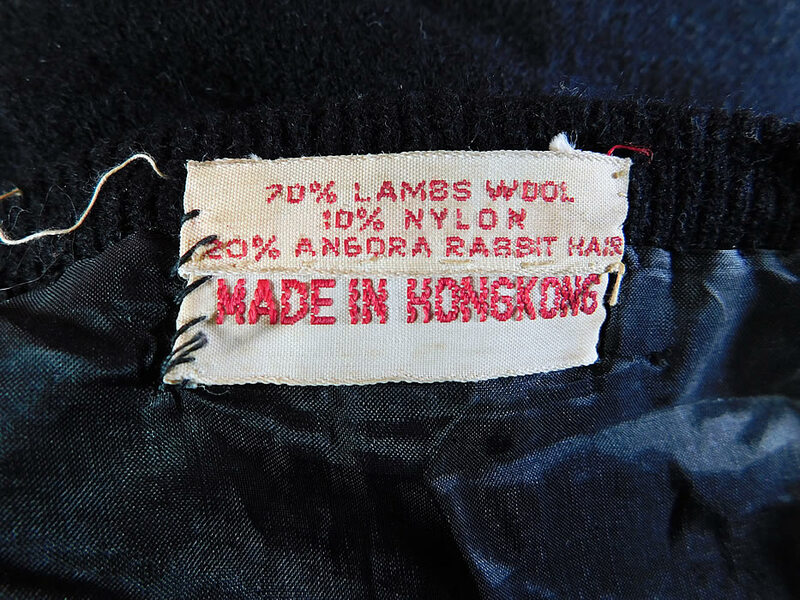 There is a "Made in Hong Kong" label sewn inside. It is in excellent condition. This is truly a wonderful piece of wearable art!